This year’s topics included: dry covers; drainage treatment; scale-up and other challenges in the prediction of drainage chemistry; and general case studies. After several years’ absence, there was also a lively panel discussion on challenges, solutions, tools and research needs to deal with uncertainties related to ML/ARD prediction and mitigation. The workshop consisted of 23 presentations that addressed current issues at mine sites in Argentina, Chile, United Kingdom, New Zealand, and Canada. 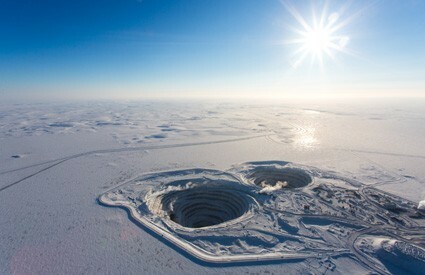 Photo: The Diavik Diamond Mine is located 300 km northeast of Yellowknife, Northwest Territories (photo credit: Diavik). Amos R., J. Langman, S. Sinclair, D. Wilson, B. Bailey and D. Blowes, A. Krentz, N. Fretz, L. Smith and D. Sego. The Diavik Waste-Rock Project: Factors controlling sulfide oxidation at the micro and macro scale. 21st British Columbia MEND Metal Leaching/Acid Rock Drainage Workshop. Vancouver. 2014. Swayze A. Maximizing community resources. 21st British Columbia MEND Metal Leaching/Acid Rock Drainage Workshop. Vancouver. 2014. Rowe R.K. Geomembranes (GM) and geosynthetic clay covers (GCL): what is known and should be assumed by practitioners about cover durability. 21st British Columbia MEND Metal Leaching/Acid Rock Drainage Workshop. Vancouver. 2014. Rowe R.K. GMR and GCL covers: what monitoring, maintenance, repair and replacement is needed to ensure and contingency plans are needed for proactive detection and resolution of problems before there are significant environmental impacts. 21st British Columbia MEND Metal Leaching/Acid Rock Drainage Workshop. Vancouver. 2014. O'Kane M. and L. Barbour. Challenges with measuring cover system performance. 21st British Columbia MEND Metal Leaching/Acid Rock Drainage Workshop. Vancouver. 2014. Weeks B., G. Lopez Vasquez and A. Santander. Integrated closure planning for waste rock and tailings in an arid climate. 21st British Columbia MEND Metal Leaching/Acid Rock Drainage Workshop. Vancouver. 2014. Nahir M., D. Hockley and P. Mikes. Arsenic trioxide management: Giant Mine Remediation Project. 21st British Columbia MEND Metal Leaching/Acid Rock Drainage Workshop. Vancouver. 2014. Jarvis A., J. Davis, P. Orme, S. Rudall and C. Gandy. The influence and implications of hydrological conditions on metal flux from long abandoned mining districts of the North of England. 21st British Columbia MEND Metal Leaching/Acid Rock Drainage Workshop. Vancouver. 2014. Sonnenberg H., L. Ramilo, J. Keene, M. Stephenson and J. Nilsen. Investigation of causes of effects on benthic invertebrate communities downstream of two metal mines. 21st British Columbia MEND Metal Leaching/Acid Rock Drainage Workshop. Vancouver. 2014. Cowan D. and B. Mattson. ML/ARD Program at Quinsam Coal. 21st British Columbia MEND Metal Leaching/Acid Rock Drainage Workshop. Vancouver. 2014. Nicholson R. Panel Discussion. Challenges/Solutions/Tools and Research Needs: What uncertainty exists? How do you deal with it? What new tools and research would you like to see developed? . 21st British Columbia MEND Metal Leaching/Acid Rock Drainage Workshop. Vancouver. 2014. Chatwin T. INAP Update (2014). 21st British Columbia MEND Metal Leaching/Acid Rock Drainage Workshop. Vancouver. 2014. Tremblay G. and C. Hogan. MEND and NOAMI Update (2014). 21st British Columbia MEND Metal Leaching/Acid Rock Drainage Workshop. Vancouver. 2014. Morin K.A. Applicability of scaling factors to humidity-cell kinetic rates for larger-scale predictions. 21st British Columbia MEND Metal Leaching/Acid Rock Drainage Workshop. Vancouver. 2014. Kirchner T. and B. Mattson. Scaling geochemical loads in mine drainage chemistry modelling - from humidity cell leachate to mine-site drainage chemistry. 21st British Columbia MEND Metal Leaching/Acid Rock Drainage Workshop. Vancouver. 2014. Day S., S. Shaw and K. Sexsmith. Progress on translating ("scaling") laboratory weathering tests on mine wastes to full scale facilities. 21st British Columbia MEND Metal Leaching/Acid Rock Drainage Workshop. Vancouver. 2014. Cash A., G.W. Wilson, D.W. Blowes, R.T. Amos, B. McNeill and J. Robertson. Structural and hydrologic characterization of two historic waste rock piles at Detour Lake Mine. 21st British Columbia MEND Metal Leaching/Acid Rock Drainage Workshop. Vancouver. 2014. Soto C. The challenge of chemical stability in Chile: the current scenario and practical applications. 21st British Columbia MEND Metal Leaching/Acid Rock Drainage Workshop. Vancouver. 2014. Mallen N., K. Malowany and B. Mattson. A phased, risk-based approach to ML/ARD assessment for linear infrastructure projects. 21st British Columbia MEND Metal Leaching/Acid Rock Drainage Workshop. Vancouver. 2014. Nelson M. The effect of geological models on ML/ARD characterization program design at the KSM Project. 21st British Columbia MEND Metal Leaching/Acid Rock Drainage Workshop. Vancouver. 2014. Jarvis A., C. Gandy, R. Harris, J. Malley, A. Moorhouse, and H. Potter. Design, construction and performance of the UK's first full-scale passive mine water treatment system for base metal mine drainage. 21st British Columbia MEND Metal Leaching/Acid Rock Drainage Workshop. Vancouver. 2014. Weber P.A., Z. Diloreto and C.G. Weisener. Passive treatment of ARD impacted waters using waste mussel shells. 21st British Columbia MEND Metal Leaching/Acid Rock Drainage Workshop. Vancouver. 2014. Merla A. and K. Pouw. Effluent treatment experience with proprietary organosulphide reagents. 21st British Columbia MEND Metal Leaching/Acid Rock Drainage Workshop. Vancouver. 2014. Bratty M., T. Rutkowski, K. Conroy and A. van Niekerk. Established and innovative sulfate removal treatment processes. 21st British Columbia MEND Metal Leaching/Acid Rock Drainage Workshop. Vancouver. 2014.